Project (not adopted, of course) of flag of President, author emigrant M.Bytinsky, 1930'. 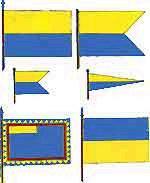 At <www.heritage.com.ua>, located by Dov Gutterman, there is an article of well-known Ukrainian vexillologist and heraldist A.Grechilo. He describes national symbols of Ukraine. Article is written still in communist period (1989). Flag of Ukraine in that time was the Soviet red flag with a blue stripe at the bottom. The author proves, that the national symbolics is not "bad". In this article he describe, between other things, flags and Coat of Arms (triangle flags, flags with the Coat of Arms in the centre etc.) which are projects designed in 1930' by Ukrainian emigrant Bytinsky. This flags (projects) never existed really and they were never adopted. Red is the (traditional?) color to symbolize russians regardless of communism. At our page about the Cossacks , Stuart Notholt says abot the Don Cossack flag: " the colours blue, yellow and red stood for the Don, the Kalmyks and the Russians respectively. (however, at the same page he describes the blue in the Kuban Cossack's flag as standing for russians... hm...). I seem to recall that the current Russian flag (which was of course designed before communism was even an idea) has similar means, the white for the White Russians, the blue for the Ukrainians and the red for the Russians of what is now Russia. Project of state flag with dark-red stripe for cossacks, disputed in Supreme Council in 1992, not adopted. To be compared with the upper proposal. Could it be two different reports of the same proposal?